I love Halloween. Always have since I was a kid. There’s just something to dressing up, going door to door, and ending up with pounds and pounds of candy. Of course, I stopped trick or treating a while ago, but I still try to make the rounds with the little ones in our family. It’s such a fun time! I’m always home and ready to run to the door when the doorbell rings on Halloween night. Unfortunately, I seem to live in areas with very little children because if I get three or more trick or treaters, I consider it a good night. In any case, I try to deck out our place to the nines with Halloween goodness. Given Halloween is less than two weeks away, our house in full on Halloween mode. Here’s a look at some of the highlights. 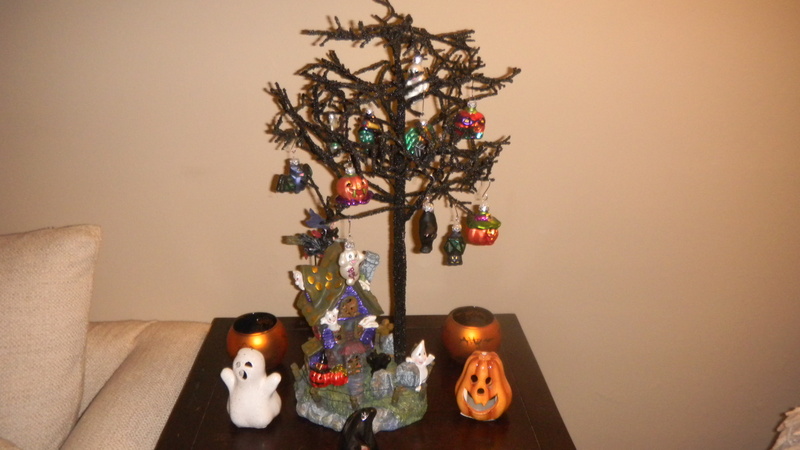 I love this Halloween tree. It was a staple at my parents’ house when I was growing up. My mom gave it to me last year. I think I got all of my holiday decoration impulses from my mom. To put things in perspective, our house always had a huge light up ghost and a huge light up pumpkin outside of it throughout the Halloween season. Not gonna lie, it used to embarrass me. Now, I get mad when I visit and see they haven’t been staked into the front lawn. Anyways, the haunted house in the base of the tree lights up, and it came with all those little Halloween ornaments. Love. 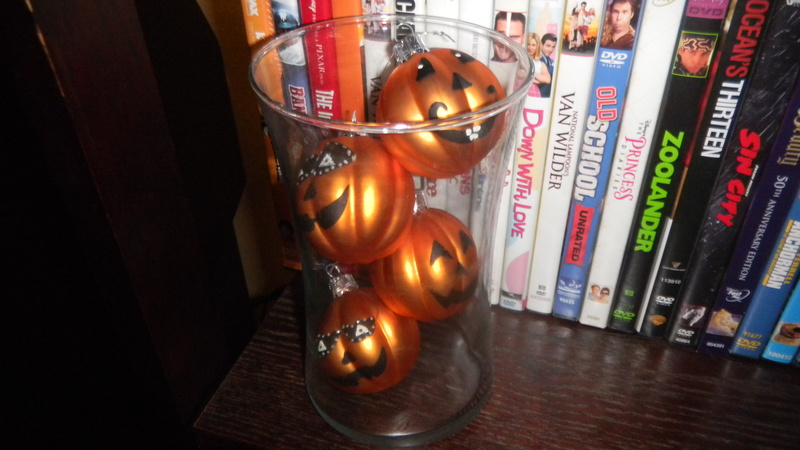 For more festive-ness, I put some Halloween votives around the tree. 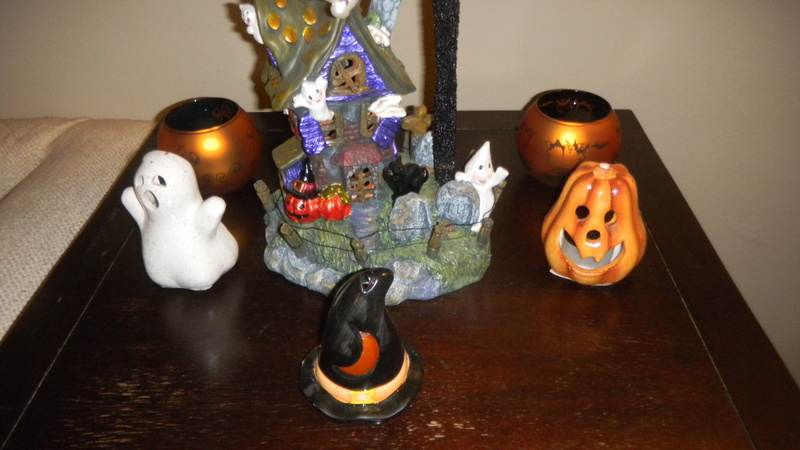 The orange sphere ones were a gift from my mom and the ceramic ghost, pumpkin, and hat were from the Dollar Store. I enjoy these little jack o’ lanterns too. They were a wedding shower gift way back in the day. They were a bit too big for the tree, so I put them in a short glass vase, which they fill up perfectly. How about this cute little lantern display? 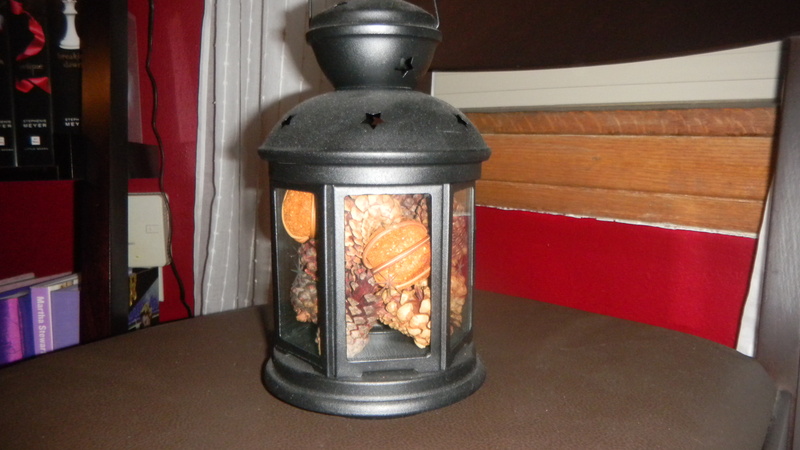 The lantern was a $1 Ikea find, and the pine cones were bought from Michael’s (the little pumpkins included) for $2.99. Normally, I wouldn’t buy pine cones, but they were cinnamon scented. I couldn’t pass them up! They smell delightful. 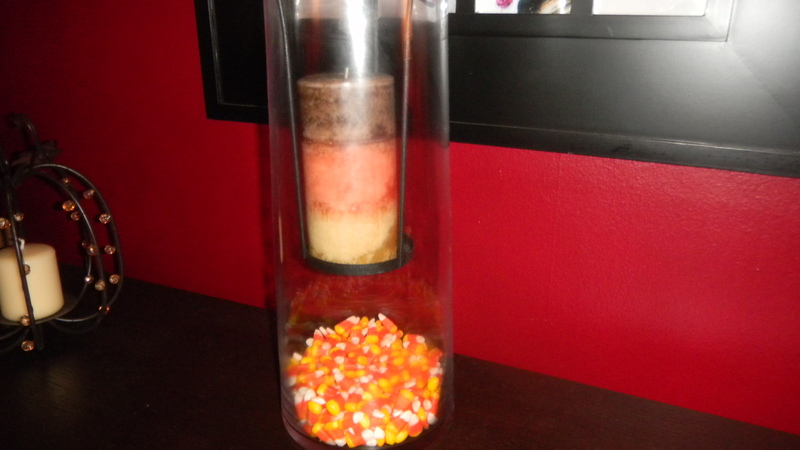 I swapped out my glass hurricane to make it more Halloween-y by putting candy corn in the bottom part, and adding a candy corn colored candle to the top. I’m loving my tablescape too. 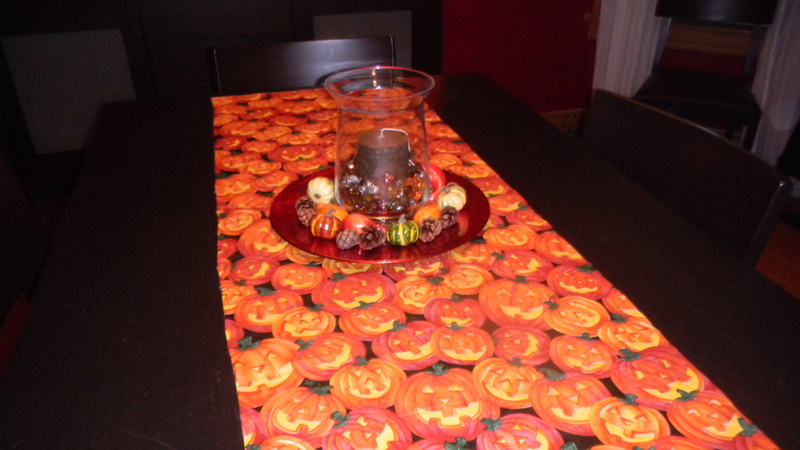 I took an old Meijer plasticy tablecloth and cut it into a runner. I’m a big fan of Halloween, but a whole tablecloth of jack o’ lanterns was a bit too much for me. The centerpiece is a simple hurricaine filled with fall colored beads and a cheap brown candle I got at Kohl’s. Those little pumpkins are from Michael’s and there are some leftover pinecones in there too. Finally, here’s a DIY bat project I made for the bookcase. Pretty easy to do, actually. The longest part of the whole project is cutting out the little bats, which you can avoid if you purchase a bat punch, like this one. I’m cheap, so no bat punch for me. I had three of these 5×5 frames laying around. Originally, I bought them for less than $1 a piece at Michael’s for a specific wall art project I never got around to completing. Oh well. 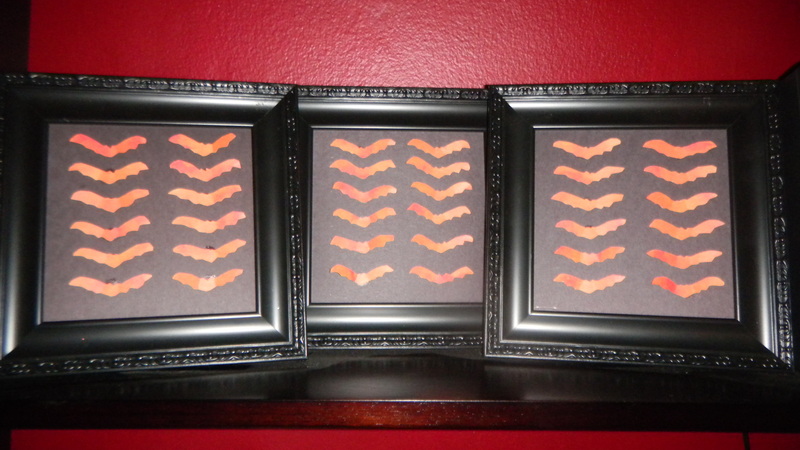 I cut out three 5×5 squares out of black construction paper and placed them in the frames. I didn’t put the glass back in, so the bats could have a 3D effect. Next, I found a bat shape online. Any one will do, it just depends on the size of bat you want. I used pretty small frames, so my bats were super teeny. Here’s a more regular-sized bat template. 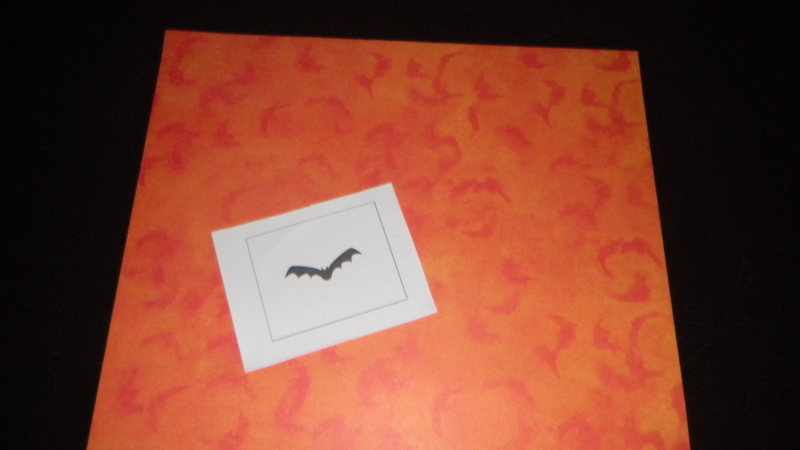 Cut out a bat and then trace it onto brightly colored paper. I used orange paper with bats on it. 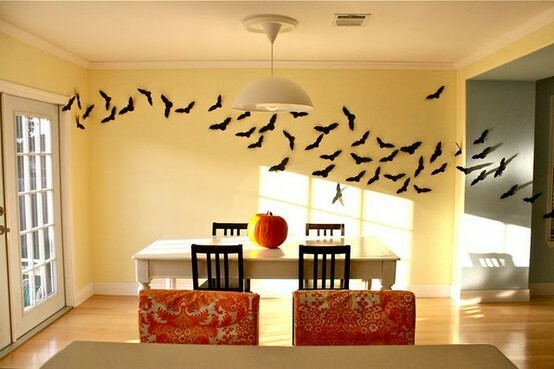 Cut out the bats and arrange them on your black construction paper. I went with two columns of six bats each. Next, I folded each bats wings up, just a little bit. That left me a flat (unfolded) part of the bat’s body, which I glued down. And there you have it, bat specimen art. Kind of a spooky take on those butterfly specimen shadowboxes you see. After I finished this project, I saw this picture and was like, I’m definitely doing that in my twisty entryway! But, that’s a lot of bats to cut out.